No, this is not a re-enactment of a scene from War of the Worlds, the one where Tom Cruise and his kid hide in a ruined building and the alien war machine’s tentacle reaches in but somehow misses them. It is, instead, one of the new lighting fixtures on Albany’s Dave Clark Path. If it seems as though I’m fixated on those fixtures, since I keep writing about them, I’m really not. But since the last report in May 4, several of them have gone up. And the work now seems to go much faster than I had given the contractor credit for. 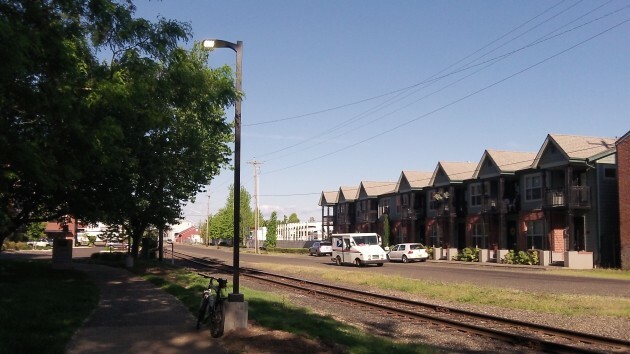 In case you missed the wall-to-wall coverage before, Crawford Electric of Stayton is installing 80 poles and lights along the 1.2-mile riverfront path, from Monteith Park at one end to Front Avenue at the other, under a $298,008 city contract funded by the CARA urban renewal district. 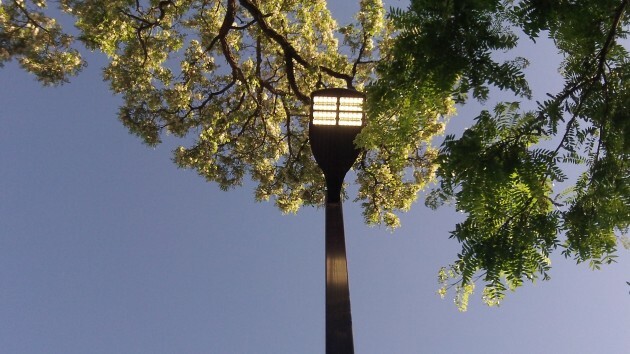 Part of the district’s overall mission to combat blight, the lighting is intended to improve the sense of riverfront safety after dark, encourage more public use of the trail, and aid law enforcement. We walked the path last evening on our way to Deluxe Brewing. I had a love/hate reaction, hate them as they have no “old” look to them while located in a historic district, love them as they really blend in and kind of hide. Bottom line, a good positive improvement made and money well spent. A fun read this sunny morning! Light hearted with a touch creepy at the same time. The up angle on first image gives me a “big brother” sensation. Somebody is watching you! Surely there were other styles & options. Was there a public hearing for yada yada discussion & selection? Who is responsible for this? Is it too late? Suppose so …sigh…onward! Nice lights. They might want to make sure those daytime sensors are working better before they write the final check to the company.